Nice 3-star Hotel Lisbona Venice! Location, location, location! 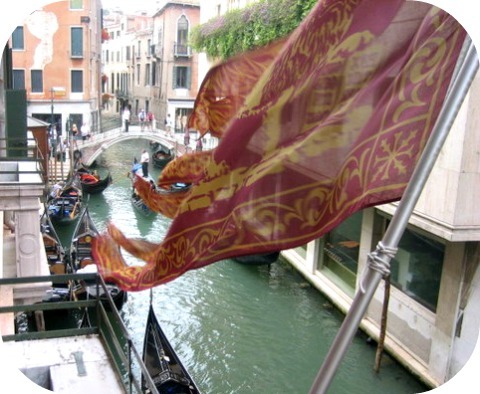 Hotel Lisbona Venice is located 100 meters from Saint Mark's Square. This 3 star 18th-century Venetian style hotel was my first choice when I visited Venice a long time ago. 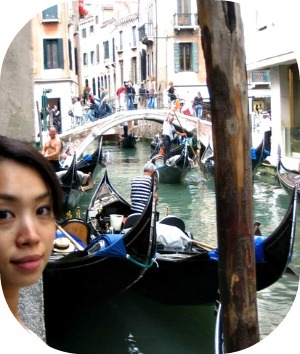 The main tourist attractions, monuments and landmarks of Venice are within easy reach. And the whole area around the hotel is a fashionable shopping district! Almost all the rooms overlook the romantic San Moisè canal and are decorated with brocade walls and baroque furniture. Of course this is the traditional Venetian style, but it is quite out dated. All hotel rooms feature a private bathroom with a bath or shower, a hairdryer and toiletries. Tip: Small and cozy hotel rooms are normal in Venice Italy. When I entered my room after climbing the steep stairs; I thought ‘this is a quite small room....’ But it was perfectly clean and comfortable. The bad point is; the small room makes it difficult to move around. When you have more than one suitcase it might be a problem. The bathroom has just enough space to take a shower. When opening the windows I could see the famous San Moise canal. Watching and hearing the gondoliers chatting and singing. Early in the morning they are preparing the day by cleaning their gondola’s. Hearing the hustle and bustle of Venice made it for me a fantastic experience. So, the noise might be a problem if you prefer silence. For a more quiet place I suggest you have your hotel in another district of Venice. Price: from EUR 80 – 195 per night per room, depending on the season. The staff is very helpful and nice. Hotel Lisbona Venice has 15 rooms. All rooms have air conditioning. The long stairs to move up to the 3th floor is very steep, which is not nice with heavy suitcases. If you are not able to do this, please ask the staff. There is no lift/elevator. Expect, no fresh fruit or fried eggs for breakfast. There are croissants, bread, cold meats, cheese, cereal, fruit juices etc. It is a simple continental breakfast and good enough to start the day. There are a few amenities at the Hotel, but it is great if you're just looking for a place to stay and experience Venice. My thinking was, I only need to sleep. The rest of the day I will be wandering through Venice. Nevertheless, the Venice hotel has to be comfortable when I come back from my day in Venice Italy. Ideal location: Easy to find, but remember the streets of Venice are like a maze. So prepare your way tot the hotel Lisbona. You take vaparetto line 1 or 2. Get off at the stop S. Marco Valaresso. Then on the quay take the street ‘Calle Vallaresso’. You will pass the famous ‘Harry’s Bar’. You definitely should have a drink and snack over here. At the end of this street take left. You are now walking in the Venice brand Shopping district. You will arrive at a small square facing the Chiesa DI San Moise Cathedral. When crossing the bridge take immediately left towards the gondoliers. The quay is getting narrower, but in the end you will find the hotel entrance, which is lovely. Interesting to watch, it’s next to a gondola station. Address: Hotel Lisbona Venice, San Marco 2153, 30124 Venezia. You've read about Hotel Lisbona. There is plenty to explore as you see. Discover Venice on my site and get more information about this Italian city.